FRIDAY, AUGUST 24, 2018 SALE TIME: 9:00 A.M. This property consists of a grain storage facility (former AgFirst Farmers Coop Elevator). It includes a main building with office, scale and feed warehouse. The feed warehouse has approximately 7,000 bus. of grain storage. 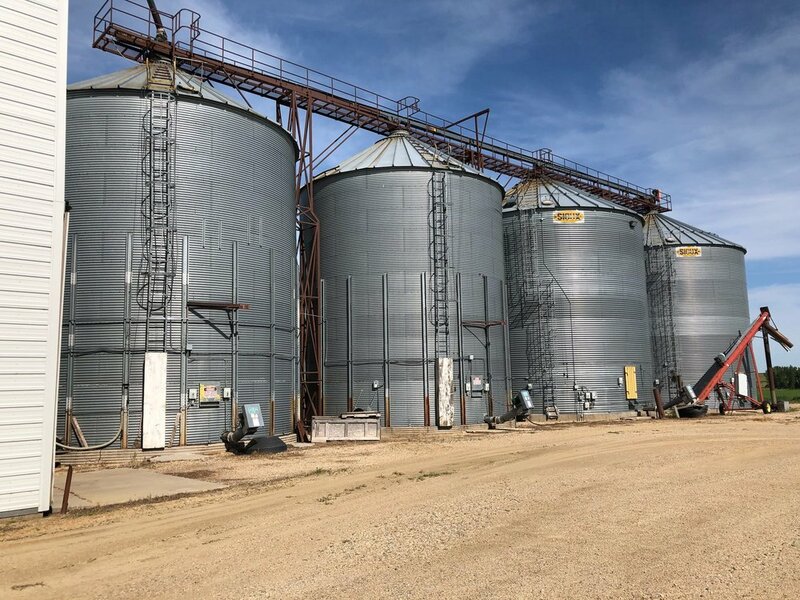 There are also 4 steel grain bins with a total capacity of approximately 92,000 bus. There is also a grain storage metal building, 48’x90’, with a capacity of approximately 43,000 bus. Legal Description: Lot 1 and the E 16’ of Lot 2 of Block 1, Third Addition and a Portion of Parcel 1, Except the E 100’ of Parcels 2 & 4, of Abandoned Railroad Property in E ½ of Section 12, T-111-N, R-149-W, City of White, Brookings County, South Dakota. Exact legal to be determined by survey. We invite you to inspect this property at any time. For pictures & additional information, contact Auctioneers & Realtors or go to our website www.burlagepeterson.com. TERMS: 10% non-refundable earnest money deposit due day of the sale with balance due on or before September 25, 2018. Title Insurance and Closing Fee split 50/50 between buyer and seller. Real Estate taxes to be pro-rated to the date of closing. Property is sold “as is, where is”, subject to existing easements, restrictions, & sold subject to confirmation of owners. Information and statements contained herein believed to be accurate but not guaranteed. Burlage Peterson Auctioneers & Realtors, LLC represent the sellers in this transaction.